Oh my. I should’ve made this dress at the start of summer! It’s only been a week or so since I made this Saltspring Dress from Sewaholic Patterns and I’m already wearing it as much as possible. 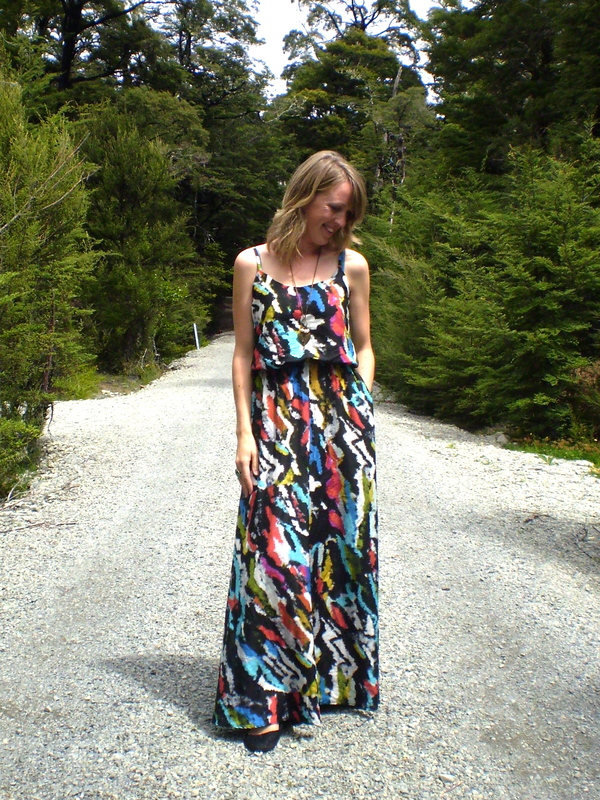 This is a maxi dress with an elastic waist, zip back, inseam pockets and tie straps. There’s also a little secret with this dress. The lined bodice is shorter than the outer layer and it’s genius, I tell ya! This means that the top blouses at the waist by itself without needing a belt or being dragged down by the weight of the skirt. Now that’s clever design. I opted to make mine from a silk/cotton blend fabric and it feels gorgeous on. Unfortunately, I didn’t buy enough fabric, so compromises had to be made. I opted to line the dress with another fabric (which I think is a rayon blend) and it feels nothing short of divine on the skin. Like butterfly kisses, or the breath of angels, or … I think you get the idea. Anyway, this different lining also meant I had to sew the back seam closed and skip the zip (because the top layer is designed to drape open and it would have exposed my lining. It’s a cool design though so I’ll definitely be buying plenty of fabric next time). It fits over my head fine, so it’s not a problem fit-wise. Like I say, compromises. I’ll do the zip next time I make this. I also altered the straps so they don’t tie up but are instead a fixed length. I don’t know about you, but ties dangling on my arms drive me crazy. I keep thinking there are flies landing on me and I just know the kids would pull on them too. Lastly, I made a sway back adjustment for a good fit and will definitely do this on all my future garments. It’s just what my shape needs. I initially hesitated buying this due to the price. By the time you add on shipping to NZ and the exchange rate, it was pricey. Until I discovered Dresses and Me! 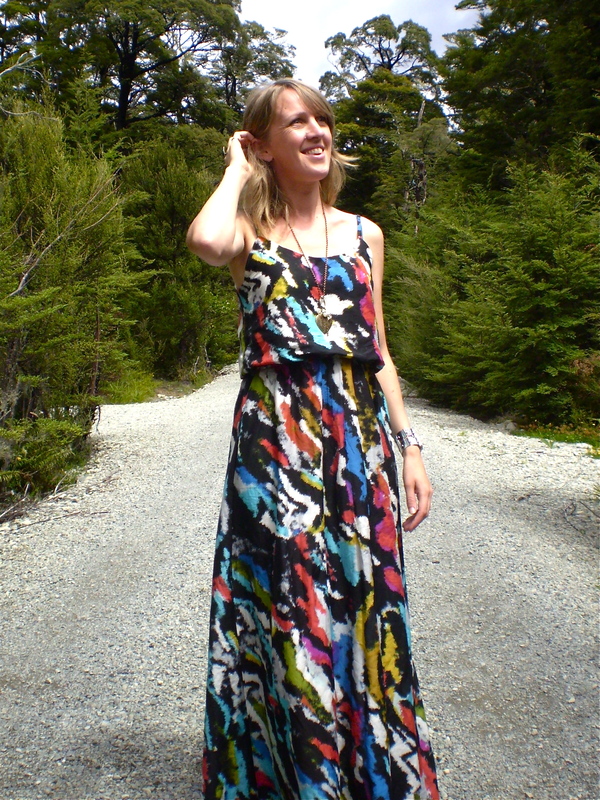 This online NZ based store sell Sewaholic, Cake, By Hand London, Simple Sews and Victory patterns at a good price and all with free shipping in NZ when you spend $40 or more. Yippee! With my order they also sent a couple of clothing labels to sew into my finished garment and a discount coupon to spend on my next purchase with them. I love these little touches! Now for the best part. Penny and Alice, the lovely ladies at Dresses and Me, are sweetening the deal even more and offering you all 10% off your purchases until the end of February! I mean, seriously, a good deal has just got even gooder. That’s right, I just used bad grammar. Just enter the code dresses2014 at the checkout. Simple as that. They’ve just upgraded their website and boy is it looking swish. You’ll also find free patterns there (perfect for my fellow thrifters out there. Woop woop!) so pop over and have a look see. Thanks Alyna. It’s a lovely pattern and looks cute in a shorter length too. The fabric is from the ex-Moreland Fabric store closing down sale. Sad to see them go! It looks lovely! the shape and length really suits you too…..I reckon you can just throw a cardy on and wear it through the start of autumn…why not? Hopefully winter doesn’t come too early! Thanks Laura. I could hide tights underneath in colder weather too. Great idea! That fabric is gorgeous!! The dress is incredible, I love it. I agree with with Laura’s idea of wearing a cardy with it in the fall or cooler temperatures. I admit I have been wearing my summer dresses with cardies, tights and boots this year.